Update: Within hours of emailing the seminar company with my reasons I did not think the description was accurate, I am surprised and impressed to report that they offered me a partial refund that brought my out-of-pocket cost closer to the student rate. I’d like to officially thank them for that. It was both appreciated and unexpected. On April 4, 2011, I attended ”Presenting Data and Information,” a one-day seminar by Edward Tufte. I signed up for the seminar, solely (and blindly) based on peer recommendations by people whose opinions I highly respect, who had either seen him years ago or read (one or more of) his publications. As I am also exploring how to give effective presentations right now, its description seemed like an amazing learning opportunity that could immediately help & inspire me. It is with those caveats that I feel very torn about how disappointed I was. Topics covered in this one-day course course include: Fundamental strategies of analytical design. Evaluating evidence used in presentations. Statistical data: tables, graphics, and semigraphics. Business, scientific, research, and financial presentations. Complexity and clarity. Effective presentations: on paper and in person. Interface design. Use of PowerPoint, video, overheads, and handouts. Multi-media, internet, and websites. Credibility of presentations. Animation and scientific visualizations. Many practical examples. Although the day started with encouraging words (“Noone is more like you than your audience.”) and compelling arguments for not dumbing-down your data to the lowest common denominator (“Your audience pours through mountains of player stat data in the sports section; Why do you have do spoon-feed them for your presentation?”), the higher-level, transcendent theme I was hoping for was greatly overshadowed by what I agree was an “apparent abhorrence of Powerpoint,” as described by Jarrod Tranique after seeing Edward Tufte in 2005. To give context on my personal views, when I saw this Coexist shirt sold by woot, I bought two of them. My first computer was a Mac, and even in 1994 when the Mac vs PC question WAS something that couldn’t be answered until you understood what the asker what trying to achieve (back then the question was, legitimately, “Is this for email or graphics?”), the way the question, “Which is better, Mac or PC?” was asked always drove my crazy. They were (and still are, although it’s more a matter of preference than capabilities today) different tools for different people with different objectives. When I hear what feels like blanket bashing of entire [entities, companies, technologies, presidents, etc] without up-to-date, quantitative data to back up that person’s opinion, I have found that I often lose respect for & sometimes have a hard time finding (as much) credibility in their content after that “angry” agenda has upstaged the intended message. In the spirit of applying the what I hope the intended message actually was, I would like to respectfully explain how today’s lessons could have felt more credible. Lesson: Don’t let the presentation medium matter. Depending on YOUR content, use whatever you need, to get your message to your audience. Contradiction: The consistent theme, repeated again and again, was his message that Powerpoint is EVIL; IPads will replace paper; Powerpoint is horrible; IPads will replace everything; Paper is better than everything until IPads replace them. He likes IPhones. Powerpoint is awful. My (possibly optimistic?) perception of what could have made all the difference: I needed data on why he considers the IPad to be such a world apart from other content delivery devices. During the seminar, I had no idea what kind of resolution and IPad has. It turns out the IPad has 768×1024, with only 132ppi. Puzzling. Buy.com sells a 1920×1080 projector, and with zoom enhancements I’ve seen presenters utilize easily to zoom in & out of their screens, the thought of keeping everyone on the same page seems more possible with a hi-res projector than if all are thumbing through their personal tablet devices to keep up. 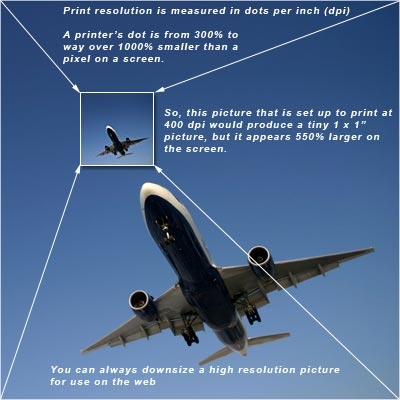 HOW you can fit 50 to 250 slides on 1 sheet of paper, anyway? He said it, but without examples or visuals to back up that statement. I would think he, of all people, could create an incredibly compelling visual. Because Mr. Tufte briefly mentioned the iPhone’s 160ppi screen resolution (although he did not elaborate), I thought that path might give me the answer. 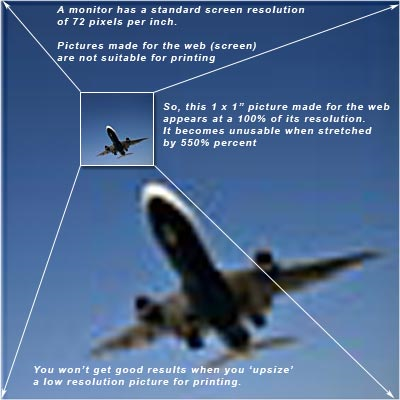 A quick search on “screen res vs print res” turned up this explanation, from which the graphics below came. To Mr. Tufte’s point on the power of a good graphic, those visuals did a better job in 5 minutes of providing fact-based, contextual credibility to the “why print is better for visualizing data” argument than Powerpoint-bashing / IPad- and IPhone-endorsing comments did for me in 6 hours. I am pretty sure HIS talk today could have been at least 25% shorter, as his “use good graphics and reduce meeting time” claim promises, had he replaced the Powerpoint-bashing with informative graphics… or better yet, if he changed is agenda from the negativity aimed at powerpoint to a positive, helpful, tool-agnostic visual aid tips & advice with a similar voice as this from presentation-skills.biz. My Reaction: According to Wikipedia, smartphones have existed and been defined as such since 1992, . My first smartphone was a Kyocera 6035 (I LOVED that device, btw) . I then got (and loved) a Palm Treo, followed by a few Windows CE devices before the IPhone even existed. I loved & appreciated every smartphone more than the one prior. Although I skipped the IPhone due to lack of slide-out QWERTY, my SmartPhone path continued with early adoption of the G1 up to my current smartphone, an Android myTouch 3g Slide. (I’m convinced that I’m a stronger believer than he is in his statement, “Don’t let the presentation medium matter. Depending on YOUR content, use whatever you need, to get your message to your audience.”) . Presentation Changes That Could Have Changed My Reaction: Once again, I wanted facts, history, and transparency. I wanted exactly what he was preaching: less “cherry-picking,” and and more credibility. Had he changed his claim even to something as subjective as, “IPhone single-handedly made smartphones usable (or simply enjoyable) for the masses” and backed it up with a chart that showed a combination of smartphone history comparing sales with screen resolution, screen size, overall pixels, data plan offerings, etc., it would have been incredibly fascinating and compelling. The data that exists to back up a Visual Display of that Quantitative Information spans far & wide, and I personally would LOVE to see that captured & translated. For example, when my Kyocera was released in February of 2001, its screen was 160×160 spanning a 2.5” diagonal (90.51 ppi) with 16 shades of gray, and it had 8MB of RAM & 2MB ROM. When the he first IPhone was released in June of 2007, its screen was 480×320 spanning a 3.5” diagonal (163 ppi) with a 144-color LCD, and it had up to 16GB RAM with 128MB DRAM. Facts like these, instead of an iphone video he made in 2004, could have changed my takeaways from wondering if Apple is paying him per times he mentions the IPad to being uplifted & inspired. Rather than his repeated reminders of his disdain for “IT” and blanket statements that apps aren’t built how he envisions they should be, I could have been inspired if I had felt like he had attempted to help SOLVE the “problems” he’s’ so vocal about. I would have loved to have seen even a tiny acknowledgement that many people are working very hard every day to innovate in inspiring ways that enable these wonderful, amazing improvements in our lives through more advanced technology. Instead, I walked away knowing he’s still bitter that his kiosk idea he came up with 17 years ago (that has been seen in his presentations by “over 250,000 people”) has still not been implemented. I was also left wondering what grown-ups he shows his tiny, thin fonts to. Even in my 30s, most people I show 22+ point text messages from my Android to have to put on their glasses & squint to read two lines. I admittedly get fired up when inspired by a speaker (or an experience or a learning). I was surprised and disappointed to agree with Craig Froehle’s reaction after seeing him in 2006 when I had full expectations & hopes to feel like Chris Sell after seeing him in 2004. I desperately wish I could have seen his seminar when his material still inspired him. In conclusion, Edward Tufte is an obviously brilliant man, who currently seems inspired to create sculpture. After spending all day in his seminar, I was left wishing he was as inspired to create solutions. I just attended the Tufte seminar in Seattle today. It was a horrible waste of time and money. I even went out to the front desk at the first break and asked if getting my money back was an option but they told me I would have to call the company and ask them about any refunds but they didn’t think that the company would refund the full amount and the prospects of any kind of customer service didn’t sound promising. So I stuck it out for the rest of the day and things just didn’t get any better. I found it very ironic that Edward’s presentation was suppose to be about visualization and effective presentations yet his presentation was horrendous and totally ineffective, void of direction, meaning and most disappointingly any significant amount of interesting visual content. Yes, he wasted our time bashing PowerPoint and praising the iPad and walking around the audience holding up books for the audience of 200+ people to squint at from a distance. The projection screens sat empty through much of the day and when his assistant sporadically projected something it was more often than not an image of one of the pages from one of the four Tufte books provided. Most of the time he spent asking the audience to look up pages in his book and would then wait around for the audience to read. The day was filled with platitudes and contradictions. Although Edward’s impact in the field of data visualization may have once been significant, he now seems to be very behind the times and he did not seem to have anything significant or current to say on the topic during the seminar. It was left feeling like a victim of a tour that was a shameless money grab milking whatever celebrity value his name still carries. I only wish I had done more research or sought out a few informed reviews before wasting hundreds of dollars and a day of my life on this seminar.